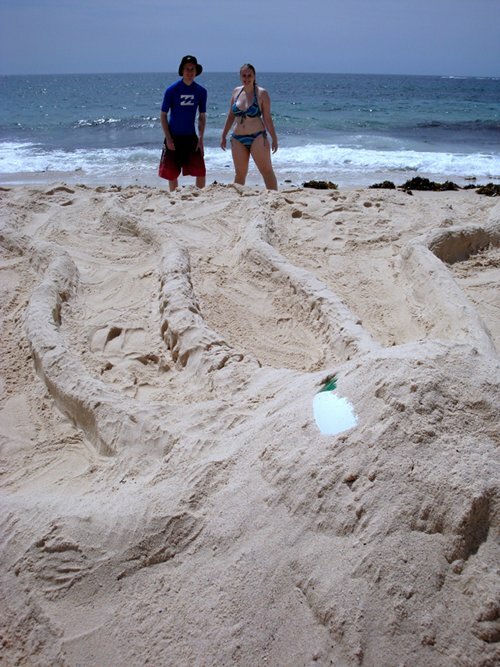 As this was the first time I’ve really built a large sand sculpture I enlisted the help of my sister and her boyfriend. I don’t believe this is cheating as the whole point of the challenge is self improvement, and teamwork and learning from others are both valuable. Successful people don’t follow the rules, they make the rules. First on the agenda was deciding what we were going to make. We started off with the idea of an octopus but quickly came to the conclusion that this was a bit cliche. 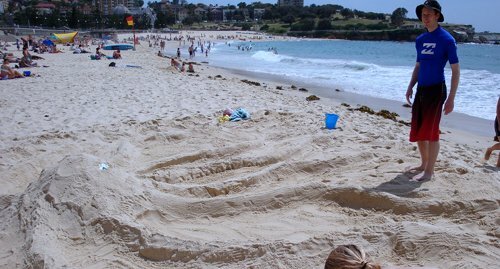 So we turned it into a sea monster instead (though I reckon the end result could have been interpreted as either anyway). Now we knew what we were making the next step was construction. We decided to experiment and use our beach ball as the body of the creature. This worked out well and in the end allowed us to make some funky eyes. I also liked the idea as it was a largish beach ball and meant we had already committed to a decently sized sea monster (which I reckon all sea monsters should be if they are going to don the title of sea monster). The next thing we realised was that we were ill equipped for the task of building a large sculpture. Sometimes you just have to dive in and you learn these things as you go. For the task of moving sand (of which we had to move copious amounts) we had nothing but our feet and hands. This was also a rather hot day being that we were in the mid to high 30’s. 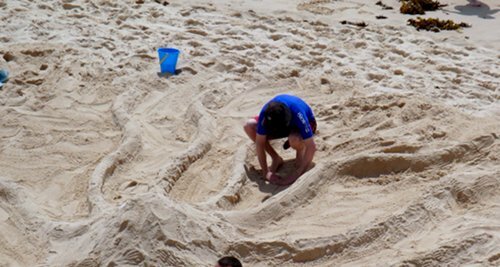 We turned ourselves into SMD’s (Sand Moving Devices) and by the end of it my skin was unhappy with me for making this transformation. My knees in particular are still letting me know that they’re not sure that this was particularly a good idea. I also had to spend a while extracting grains of sand from under my finger nails despite them being very short. Moistening the sand so as to be able to sculpt it also proved difficult given that all we had was a bucket and also that it was rather warm. Use of the bucket resulted unplanned patches becoming soaked while the majority of it stayed dry. It was kinda like trying to apply tomato sauce to a hotdog from a distance of 2 meters (but not being able to readjust the splatter after). We managed to get by but next time I’m going to try a spray bottle instead. As a first attempt I was pleased with the end result. 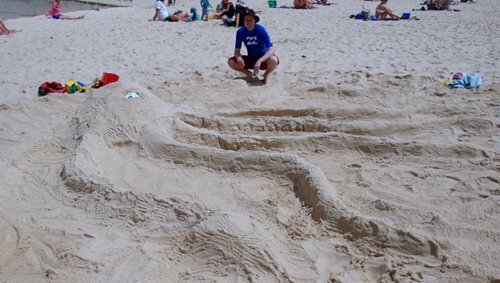 Not only did we succeed in creating a sculpture that actually resembled what it was supposed to, it also provided a dollop of fun for everyone. We were soon to discover that it was also going to be fun for others. We went for a swim after finishing to try and convince the sand covering us that we should go our separate ways and upon returning found a family had taken up residence in one of the tentacles and that a bunch of kids hat taken our beach ball. 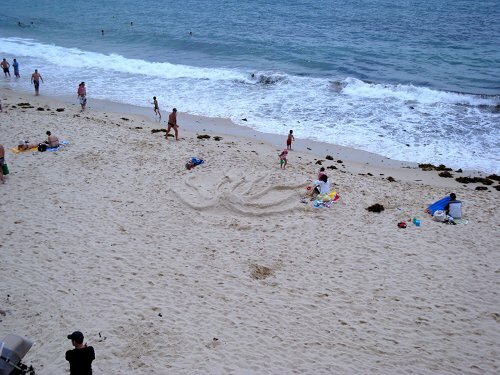 Oh well, I suppose sand sculptures aren’t meant to last. 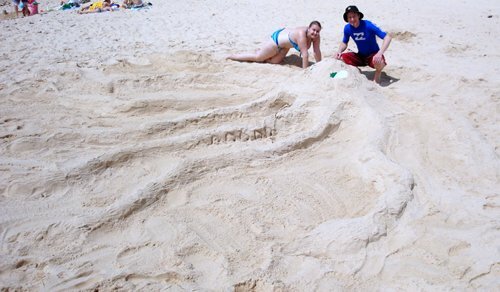 expect sand to get everywhere. 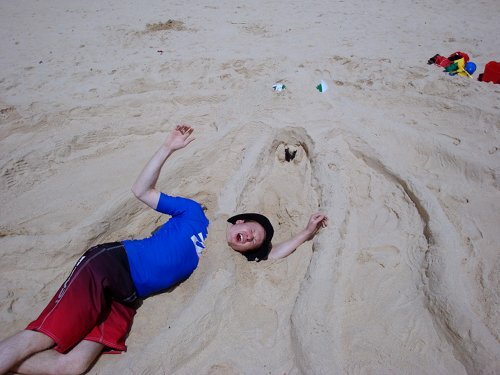 Essentially you will become one with the sand. 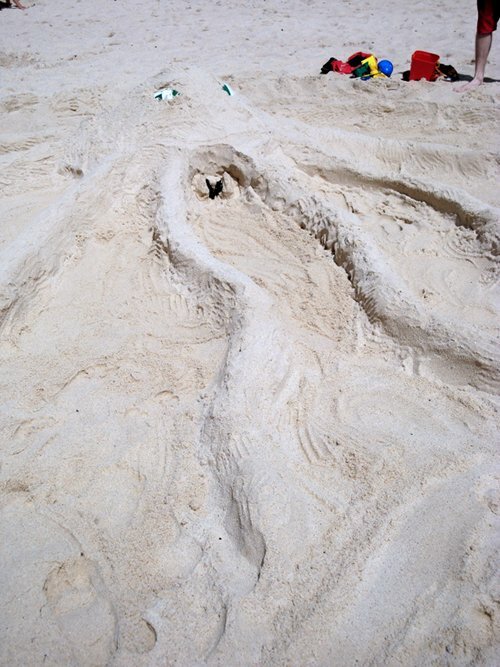 sand is an awesome environment for experimenting. You are going to run into problems in things you can’t do. Yet at the same time it allows you to easily try things and if they don’t work you can just brush it away and start again. it’s all about the process, not the end result. The end result won’t last so instead value the process and have fun, you will get a lot more out of the experience. 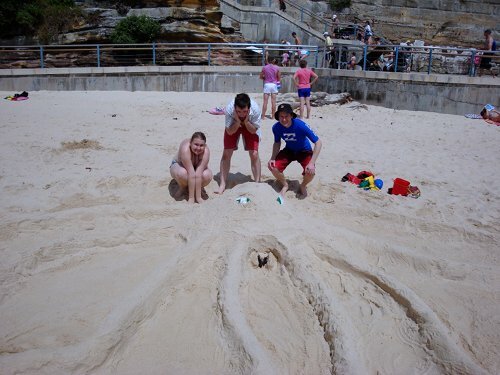 Evidence that we did indeed have fun with sand. Why, why indeed. Apart from the fact that it was fun I am doing this as part of the meahq.com 100 Steps to Greatness. It’s 100 challenges to help you become better, to expand your range of experiences, to get out of your comfort zone and to build confidence. Every week I’m going to tick one of them off and blog about it here so come back regularly to see what I’ve been up to.